In light of a recent article profiling a one-year old boy suffering from Moebius Syndrome causing complete facial paralysis, Dr. Azizzadeh, Director of the Facial Paralysis Institute in Los Angeles, would like to address a question that presents itself from time to time; How young can children have surgery to correct facial paralysis? In the article that sparked Dr. Azizzadeh to provide an answer to this question, Preston’s condition and treatment options are examined, and his family is currently raising $100,000 for corrective surgery when he reaches the age of five. However, Dr. Azizzadeh believes that treating facial paralysis in children as young as 2 can be an excellent option for the correct candidates. 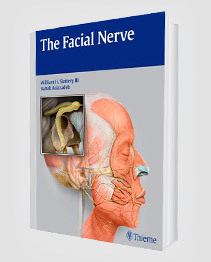 For children experiencing unilateral facial paralysis, a revolutionary surgery known as a masseter to facial nerve transfer can be performed as young as two years old to improve facial reanimation and symmetry. At the Facial Paralysis Institute in Beverly Hills, Babak Azizzadeh, MD, FACS, expert facial plastic and reconstructive surgeon, believes that this procedure is one of the best options for creating a natural smile. During a masseter to facial nerve transfer, Dr. Azizzadeh can harvest the trigeminal nerve, which is responsible for activating the chewing muscles, and surgically suture it to the paralyzed facial nerve. This allows for increased neural input to flow to the once paralyzed muscles, promoting excellent reanimation for the right candidate. 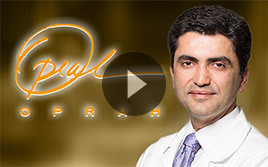 For children who aren’t a candidate for a masseteric nerve transfer procedure, another option is to undergo a gracilis muscle transplant, in which Dr. Azizzadeh harvests the gracilis muscle from the thigh along with its vein, artery, and nerve, and introduces it to the paralyzed side of the face. This surgery can be performed when a child is five years of age. When a child undergoes surgery to correct facial paralysis, there are obvious physical benefits that can be seen as they continue to progress in physical therapy and regain the ability to smile. However, when the surgery is performed at such an early age and the problem is corrected, the child will also enjoy emotional benefits as they will never have to worry about not being able to smile and will be able to show emotion as other children do. 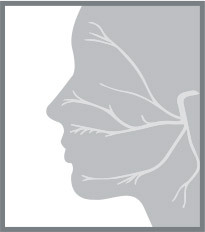 If you or a loved one is dealing with the affects of facial paralysis and have yet to find a treatment that works for you, we encourage you to contact our medical center today to schedule your initial consultation with world-renowned facial plastic and reconstructive surgeon Babak Azizzadeh, MD, FACS. 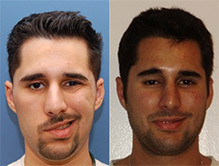 Dr. Azizzadeh has a unique understanding and training in performing facial paralysis surgeries and non-invasive treatments for individuals of all ages, races, and genders. For more information about what types of facial paralysis surgery for children can be a viable option, or if you have any additional questions, please contact the Facial Paralysis Institute by calling (310) 657-1002.